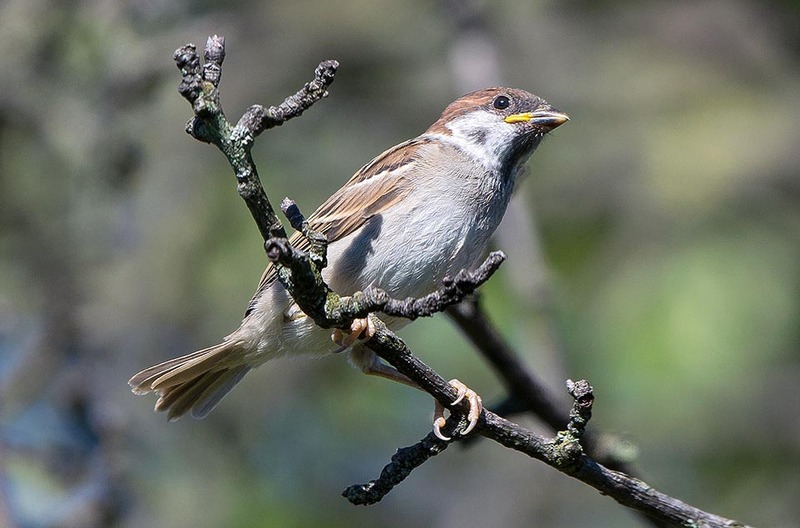 The Eurasian tree sparrow, called also European tree sparrow or Tree sparrow (Passer montanus Linnaeus, 1758), belongs to the order of the Passeriformes and to the family of the Passeridae and is a species very common in the boreal hemisphere. Although it has met during the last decades worrying decreases, in particular in the areas devastated by the modern agricultural modifications, it is always a very common bird and in expansion in the territories where it has been introduced by the man. Very similar to the house sparrow (Passer domesticus) with whom it shares most of the territory, has a much more shy and reserved character and despite also living in close contact with man, keeps always that discretion that distinguishes it from its congener. It is a frantic small bird, never steady, continuously moving even when perched on a branch, stirs wagging its tail to the right and left like an overexcited, jumps and turns, looks up and down and then immediately away on another branch and again stirring. By sure there was a good reason to call it in the past times in Italy, mattugia, dialectal term coming from matta (mad), a so real statement to remain fixed in the time without any modification. By sure, it is really crazy but perhaps also for other reasons not written but well reminded by the country boys of the last century, frequent visitors of banks and woods and always looking for nests, where they found broods of these sparrows with a huge number of eggs inside them. Here it is that from the top of the trunk dangling from a branch, the arduous climber looking dejected at the friends on the ground, repeated, as if it was a common disappointment… it is a mad’s nest. It is strange that only the Italians did call it insane seen that the agitated behaviour should have been noted by everyone. Only ones the French who with friquet did call it roguish even if Buffon, the famous naturalist of the XIX century, describing this bird always in movement, wrote: “…mad sparrow because cannot stay one moment quiet and from that perpetual moving rightly gets its name. It has been noted that however its temperament sweeter than what is our house sparrow, it is not so meek, that it proceeds in its nature that drives it away from man and that for being a little more wild does not leave it to be perhaps better”. In the various European countries they have preferred, on the contrary, to call it field sparrow, tree sparrow, mountain sparrow, and even sparrow miller specifying in any case the characteristics of the environment it frequents, well different from those of the house sparrow. 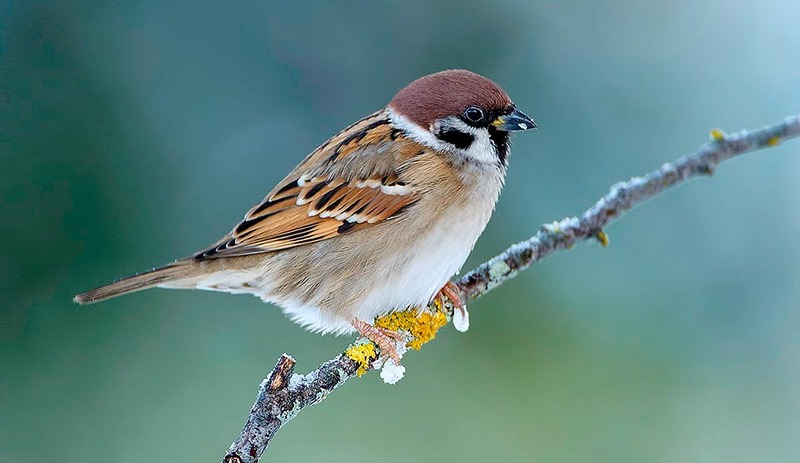 In Europe it is called Eurasian tree sparrow in English, Feldsperling in German, Gorrión molinero in Spanish, Moineau friquet in French, Pardal-montez in Portuguese and Passera mattugia in Italian. The etymology of the name gets origin from the Latin with Passer rom the homonymous term with meaning of sparrow and the species montanus = of the mountain, to indicate its supposed origin. For this nomenclature Linnaeus took as a reference the news reported by an observer of the late ‘600 who referred having seen many of them in the mountain region of Styria in Austria during a trip from Vienna to Venice. Thus he decided to call it, perhaps inappropriately, montanus. The range of the Eurasian tree sparrow is very vast and covers the whole temperate and subtropical areas of Europe and Asia. The introduction in tropical and equatorial countries of South-East Asia has seen a considerable development of the species, with an adaptation that was not thought initially possible and then so rapid. Striking examples are in Malaysia, in Borneo, in the Indochinese peninsula and also in Australia where the species not only has found no difficulty in settling but even has developped consistent populations and nowadays unmovable. We can say that in the gardens and in the parks of the cities of these nations, the Eurasian tree sparrow has become one of the most present species. In Europe it reaches the southern part of the Scandinavian peninsula, the Baltic republics and with an almost perfect latitudinal line, reaches the Siberian coasts of the Pacific Ocean. The continental Asia is totally occupied up to the northern slopes of the Himalayan chains, missing, on the contrary, completely in the Middle East, in the Arabian peninsula and in the Indian subcontinent. It is not present in Africa replaced by the house species in its various subspecies even if being common in all the Mediterranean basin. It is considered as a migratory species even if its displacements, however regular, are at short range and often do not follow the directions north-south of the real migrators. However, in many areas it is resident and sedentary. 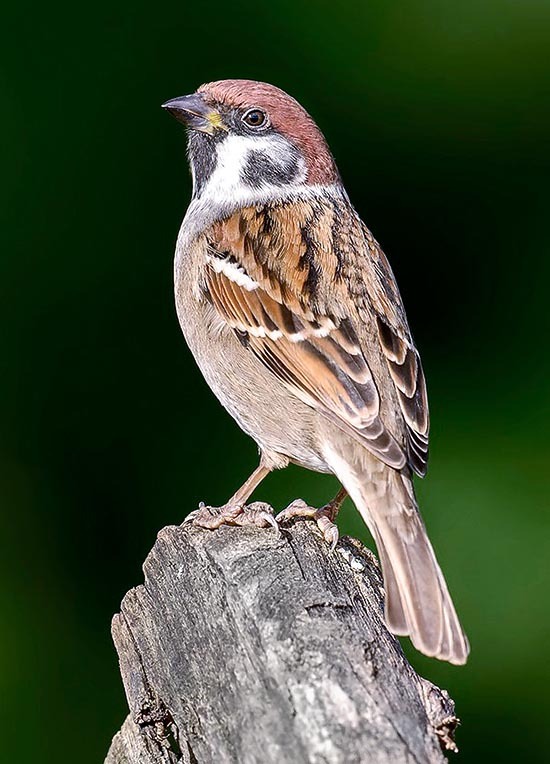 About ten subspecies have been classified among which the Passer montanus montanus that occupies Europe and northern Asia and the Passer montanus transcaucasicus that as the name says, is concentrated in the Caucasian region. Seen the increase of populations formed in countries far away from the original range, due to voluntary introductions, it is possible that in the next future new subspecies will be classified. 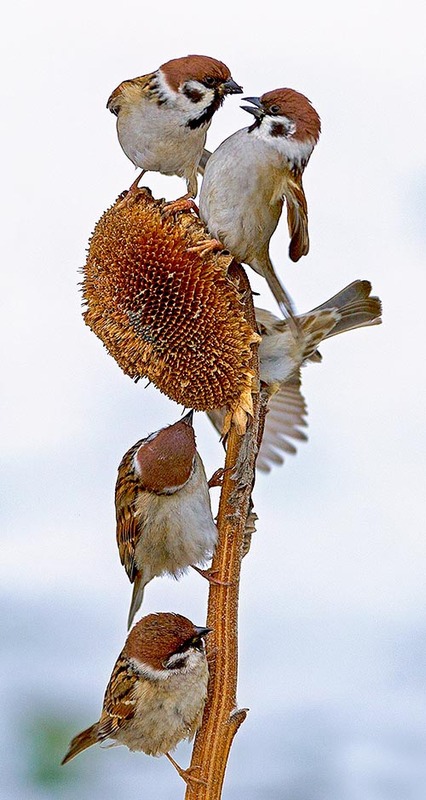 The Eurasian tree sparrow is a small bird of our countries, of the rural dwellings, of the vegetable gardens and of the orchards, of the thickets and the rows of mulberry trees, practically the environment around the farms and the rural centres. It is absent in the cities and in the inhabited areas where it is replaced by its cousin, the house sparrow. It is a social species like all its congeners and spends the whole life together with its similars. It is extremely rare to see one of them alone even during the nidification period, it is much easier to observe it in small groups while feeding as well as in the small colonies that it forms when it nidifies. It is sure that we shall not see any more the immense flocks that it formed some decades ago in our countries in late summer that saw thousands of specimens gathering to peck in the freshly mowed lawns, the scattered seeds of the numerous essences it loves. Contrary to the house sparrow, the Eurasian tree sparrow is not a great devourer of cereal grains so the damages it caused to the cultivations were not so important as those caused by the first and the countrymen knew well this, so much that the struggle against the sparrows for reducing the damages to their cultivations was almost all directed against the house sparrow with the construction of the fateful sparrow houses. 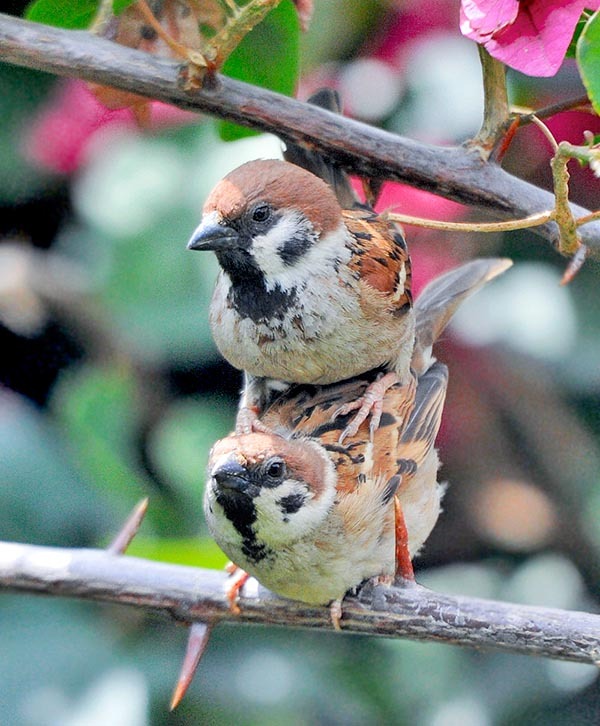 In Italy the Eurasian tree sparrow had during the last decades a decrease. Like many other species, the agriculture has modified so drastically the original habitat taking off any possibility of sustenance of the so vast colonies present before. Furthermore, has not failed the diffusion of the so-called new generation pesticides that have dramatically worsened the situation. The consequent and sudden substitution of stable meadows and of those where alternated seasonal crops, with entire lands transformed in monoculture of corn and soybeans, has given the final blow to these poor small birds. Is not less the abandonment of the farmsteads and the resettlement of those left with modernization of roofs and façades that have caused the elimination of many sites where they found shelter. Like for the swallows, it has been noted that the deserted farmsteads are in turn abandoned by this species. Last and heaviest modification has been the extirpation of thickets and rows of old trees subject to prunings and heavy cuts, for the supply of wood for the winter heating. In the North Italy countries these spectacles were common and all the rural families used to burn wood obtained with this operation. The pollarded trees full of hollows, of cracks and crevices, as well as the rows of very old and enormous mulberry trees, were the kingdom of the Eurasian tree sparrow, as well as of the hoopoes (Upupa epops) nd of the Eurasian wrynecks (Jynx torquilla). And, in fact, with the deletion of these habitats, entire populations of these species have suffered dramatically serious consequences. The Eurasian tree sparrow is the smallest European passerid having a wingspan of only 20 cm, a weight of 22 g and a length of 14 cm. Very similar to the house sparrow, it has instead a leaner and thinner body size and a tail slightly less pronounced than its congener. In addition to having more reduced dimensions, it has also a vitality in the body to make it looking smaller than what it really is. It is very similar also in the livery and often seen from the backside it might be easily mistaken with the house sparrow. The main colour is the hazel brown that covers the shoulders, the head and the tail, evidencing on the hood a chocolate colour more compact and clear, surrounded by a showy very white collar ending on the chest. The bill is very black when in nuptial livery and is accompanied by a bib, also jet-black, that goes down shortly on the chest contrasting with the cream colour of the lower part. Also the eyes are very dark. On the cheeks, in correspondence to the white collar, is present a black spot well detached and evident that is absent in the young livery and is one of the main indications for a correct classification. The alar cover is marked by blackish and more marked brown spots that give the look streaked to the whole body. There are also two white lines in correspondence of the primary and secondary coverts that cross longitudinally the whole alar cover. The legs are of flesh-colour. There is no distinction between the sexes apart the spot placed on the throat often more marked in the male whilst the young, although wearing the first livery with the same colours as the adults, are easily recognizable due to the paler tonalities and for the very prominent and yellow labial commissure. The winter livery differs slightly from the summer one having colours sensibly more opacified. The Eurasian tree sparrow is a good reproducer and in the good years makes even three depositions. 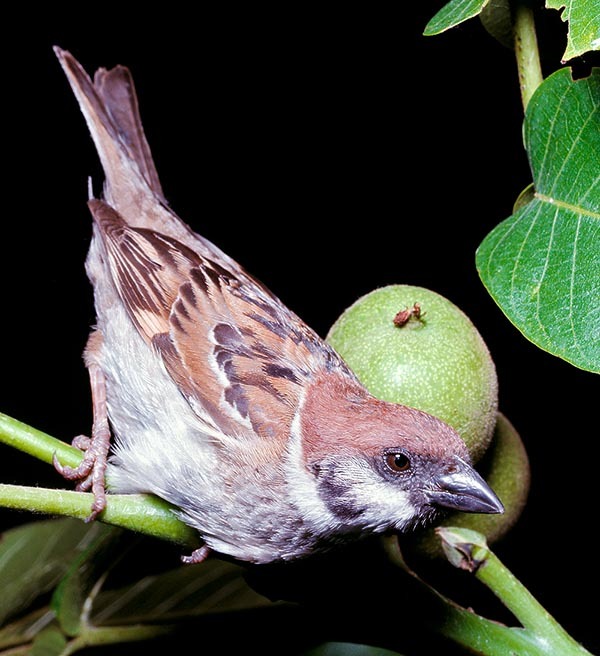 It is a species more solitary than the house sparrow but does not disdain living in scattered colonies, with a limited number of couples but with nidification even at short distance. It was not rare to find more nests on the same pollard, with entry holes even common but with separate chambers. Perhaps the origin of the broods composed by an unusual number of eggs could be a consequence of this strict promiscuity. It often nidifies under the tiles, in the old nests of swallow (Hirundo rustica) or of redstart (Phoenicurus phoenicurus), in holes in the walls of farmhouses, in the abandoned attics and also in stables and barns. 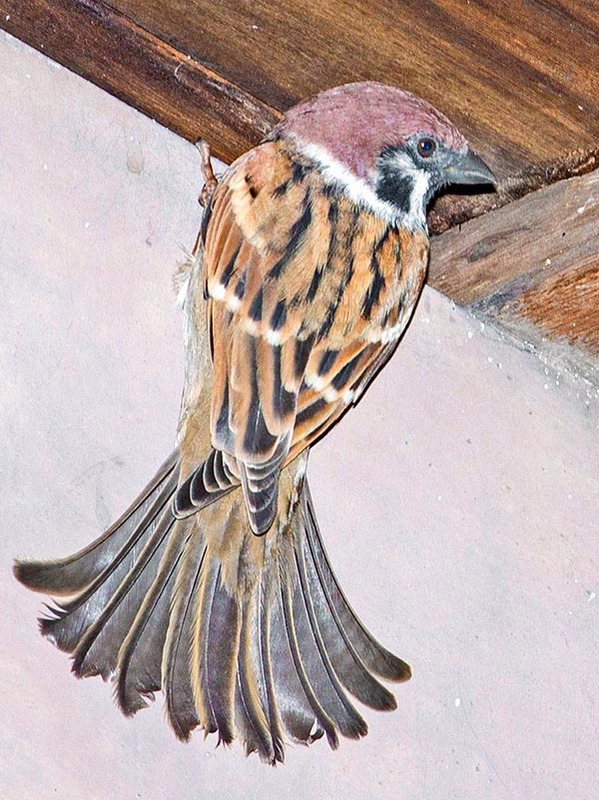 In the farmsteads, with the purpose of taking off the chicks for food supply, they used particular sparrow houses much more reduced and less industrialized han what was done with the house sparrow: a rudimentary wood construction with few holes and immediately were occupied by the Eurasian tree sparrow. This habit nowadays has been promptly recalled by the sparrow, with the fruition of the more modern and less grim nest boxes placed in their help. It is curious to note how in every nest of stork there are nests of both species of sparrow hidden inside the enormous quantity of sprigs forming the platform. An accepted union even if it is not rare to see storks to catch on the fly eventual inattentive chicks. The nest is a mass of dry grass of globular shape and with lateral entrance, well lined inside with down collected in the farmyards or even fluttering in the air, seen that often they are seen catching on the fly masterfully, those very ligh feathers transported by the wind. It usually lays up to seven eggs of quite variable colour and tonality but usually whitish heavily dotted almost to cover totally the background, of tiny grey small spots. 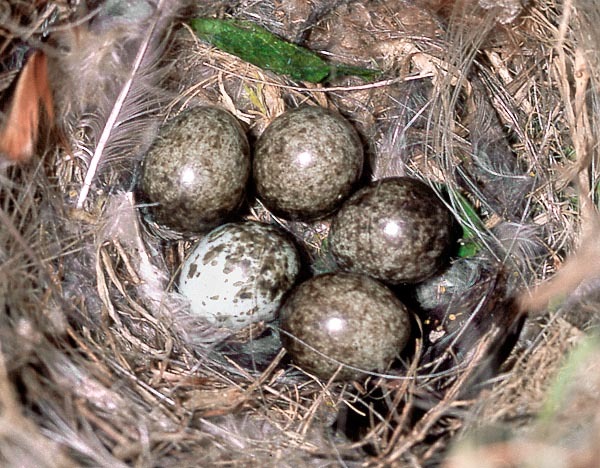 Often in the nest may be seen eggs of different colour as if they were laid by other birds. The brooding is done by both parents for about 12/14 days and the chicks keep in the nest for 15-20 days more even if often they are very impatient and then fall from the nest precociously. 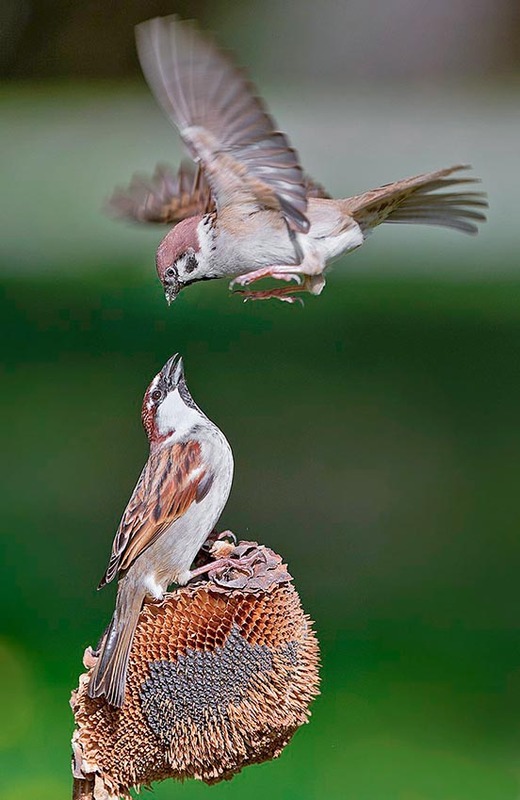 The feeding of the Eurasian tree sparrow is extremely varied and we could assert without any doubt that it is a practically an omnivorous bird. The insects stand at the base of its feeding in particular during the breeding of the offspring but is at the same time an avid granivore eating seeds, fruits and vegetal material of all kinds, having a very sharp and fine bill that allows him to accede to very tiny seeds widening in such way beyond measure its already very stocked vegetal menu. It is also a species very talkative and signals its presence continuously as sign of contact with the similars as well as about warning of possible dangers. The adults emit the traditional nervous and repeated cip cip cip whilst typical is the call of the chicks when just out from the nest who with their cirlip cirlip emitted incessantly for hours from a twig keeping invisible, draw the attention of the parents and also of the curious passersby.